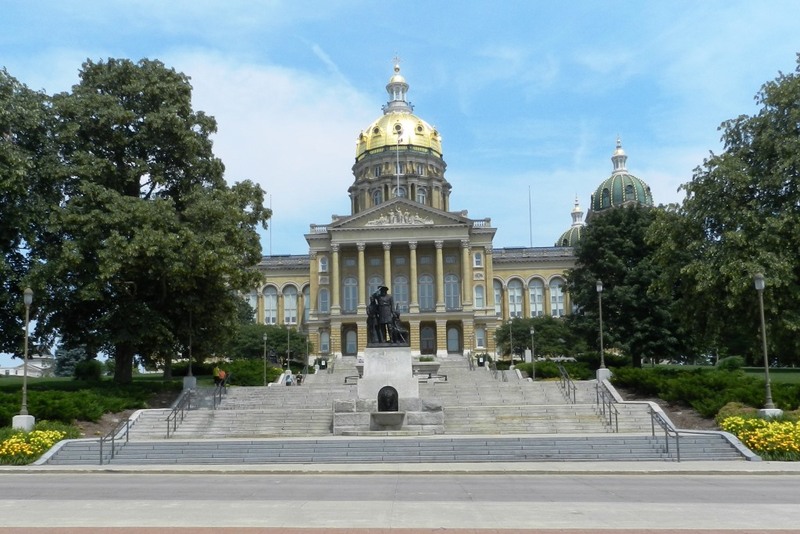 Iowa became a state December 28, 1846, the 29th state admitted to the Union. Fort Des Moines (De-MOYN) began as a military garrison on the Raccoon and Des Moines rivers in 1843. The territory was later opened to settlers, a city grew, and it became state capital in 1857. The capitol was completed in 1871, and its towering central dome is covered in 23-carat gold. Even the four small domes have golden seam marks. Des Moines is the largest city in the state and the hub of industrial, financial and political activity. More than 60 insurance companies have home offices here. Living History Farms is a complex of four farms on 600 acres. There is a Native American settlement of 1700, a pioneer farm of 1850, a horse-powered farm of 1900, and an 1875 village, Walnut Hill. Tour the gardens, watch the farm-chores, learn about crops typical of each period. More farm history at Heritage Village – early farm machinery in a century-old barn; stores, church, school, railroad station. The lushness of the sprawling farms and rolling hills; the green, green grass in every suburb and every downtown park, well-tended and fine to see; the thoughtful use of riverfront space; the appeal of downtown living; layers upon layers of things to see and do. Mountains near: Loess Hills. Hawkeye Point, in the northwest corner of the state, is the highest point in Iowa at 1,670 feet.